Hi there and thank you for taking the time to read our devlog! We will have weekly updates and this main post will be updated with new screens and info! 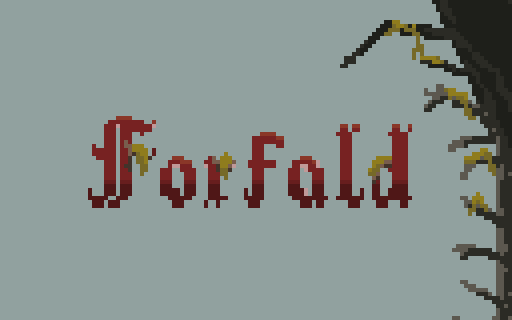 Forfald is a combat-focused sidescrolling roguelite set in an afterlife that has fallen into decay and corruption. As mentioned in the elevator pitch the gameplay will be focused largely around combat, which means that we won’t be throwing large amounts of enemies at you at once as many roguelites do. Instead the game will have generally tougher enemies that take skill to understand and kill. We plan to add one or multiple boss fights to each biome as well. The game’s levels will be procedurally generated in a metroidvania-inspired structure. We will be focusing on using hand-crafted rules and rooms to assure a not too random feeling experience for each run. The game is being developed in our own game engine written in C++, which has support for Windows, Linux and Mac. We've been working on a playable demo and testing out the combat and movement mechanics with a few enemies and a predefined level structure. We have recently established an art- and thematic style we want to go for, and created our first concepts for the world and its inhabitants. The first zone we have created a more detailed concept for is a zone that we for now are calling “The Catacombs” as a working title. The gif below shows a rough image of what this zone might look like. We are hard at work getting a playable demo ready as soon as possible, so we can really test and explore the possibilities of the world we want to create. Glitchheart is an indie developer founded by two brothers Daniel and Niels Bross. We are both very passionate programmers that have always had a strong interest in the game development process as a whole. Thus we set out to make a game that we knew that we would love to play ourselves. This project has been through a bunch of mechanic iteration and prototyping before we’ve settled on a type of gameplay that feels perfect for the game we want to make. Hi there! And thank you for the kind words! Always nice to meet more danish game devs! A lot of new stuff has happened already! We're slowly iterating on the combat and as you can see we actually have a working demo to test it out. Animations and art are there to give a feel of the aesthetics of the game and will be revised as soon as the gameplay feels more solid. I spent some time implementing a ledge grab instead of using something like a double jump or wall jump. We are working on adding two enemies with full animations for the next update! Since combat and timing is very important in this game we'll make sure to add telegraphed attacks so the player is able to know what's coming and react to it. It's very important to us to give the game a sense of fairness so that it is never the game's fault that you died. So since last week we've been working on getting all enemy animations ready for testing out the combat. 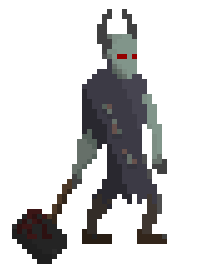 The hammer-enemy, as we call him at the moment, now has a running animation, one attack animation and a death animation to give a better feel of how the pacing of the combat will be. As you can see there is still a lot that feels off about the combat and that is what we're gonna focus 100% on now that we have more animations. We used to have an animation system in our engine that made controlling animation state almost impossible. You'd have to remember a lot of handles to every animation for every entity. Therefore we decided to redo the animation system and look at what worked in other engines. Before doing our own engine we had used Unity a lot and really liked the animation controller they had, so we took a similar approach and implemented a node-based system with transitions and parameters. 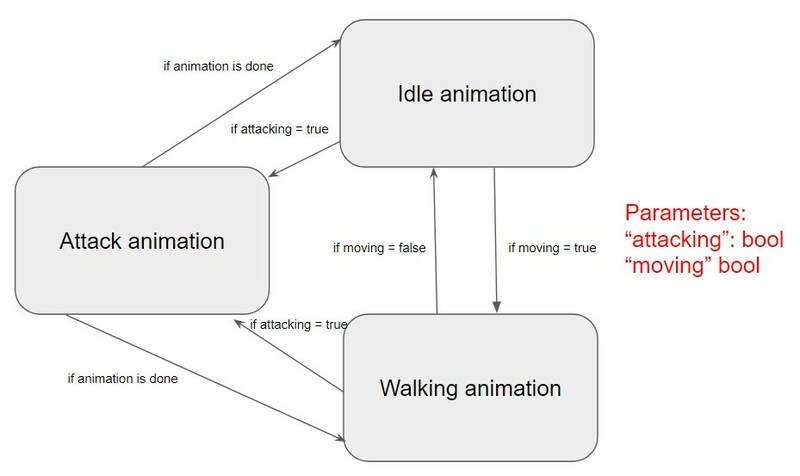 Every animation now is a node in the graph and when adding a transition between two nodes you can set conditions that have to be met before the transition can take place. So similar to Unity you can add boolean parameters with names like "jumping" or "attacking" that can be checked for certain values when the animation controller runs through the possible transitions. Every frame in an animation node can have a callback that can be used to trigger any code. This system allowed for a more robust system and made sure that most of the animation code would be run at the loading stage of an entity and not in the game loop. Since we're only working at most 7-20 hours on the project each week not much progress can be made every time, but after finally getting the new animation system up-and-running and having enough animations to actually do some gameplay with we'll be looking at the combat and try to get rid of all awkwardness in the controls and enemy AI. We've been talking about removing the stamina bar, since it really doesn't make that much sense in our game, but we'll see what happens in the next update! Until then! Looks like a solid start. The dodging and animations look good. I hope you come up with some unique ideas to use the afterlife as a setting. Good luck with the game. The title screen alone shows a lots of promise, I love the colors. The character design for the monsters is very cool too. I'm glad you liked the animations! We'll be posting some more on that soon I hope. As mentioned in the last devlog our main focus has been combat for the last week. We bumped up health and damage of both enemies and this resulted in harder fights and required more focus of the player. Without more than one attack for the enemies the combat still feels a bit predictable in the wrong way, so we're working on getting more animations in there and making the attacks even more telegraphed. Another new feature are rune stones. Mechanically they give the player a choice to destroy or activate them. Destroying the rune stone will give the player more fragments that can be used to purchase items/upgrades from NPCs/shops that can be found in the game. Activating gives the player an upgrade point that can be used to upgrade health or strength. However, getting the upgrade also means having to give up some health for strength or some strength for health. We've also talked about having different rune stones with different upgrade-types, but we'll talk more about that later! As we're still learning to do pixel art while developing this game we're constantly improving the designs and animations. That's why we'll be working on adding new attack animations to the player. We're also working on adding ladders and will probably start doing simple level generation next! This looks pretty rad, well done on your art.